The only update here is that I've got four out of five chapters done rough-draft-style. I'm taking a few leftover vacation days here and there to help me in the process. I have to have all five chapters to my advisor by November 1. Ahem. I'm burning daylight, here. October was mostly travel, complicated by a case of bronchitis that knocked me down for several days, so I've not been as productive as I'd have liked. Oh well, it'll get done! My podiatrist did follow-up x-rays at my appointment earlier this month and wasn't altogether pleased with the progress, so I'm doubling-up on my at-home physical therapy (bending my toe as much as possible). He also gave me a cortisone shot to help with the swelling and stiffness, so I should be more comfortable doing the PT and my workouts. I've gotten permission to start doing my walk/run routine again and ended up buying yet another new pair of sneakers: Hoka One One (pronounced "oh-nay"--some Polynesian term about being fast or something like that). This one finally seems to work well. Look at that sole. Yikes. They look orthopedic, but the website proclaims that marathon runners love them, so I prefer to think of myself as in the company of amazing athletes than the one of people-with-bad-feet. The toe box is a little wider, it's pretty stiff, and although it's not technically a rocker-sole, it does help roll you forward so the injured toe doesn't have to bend. They're highly recommended for runners with foot issues like mine. I have to say, they do seem to make a huge difference. I can now do my walk/runs with just a little discomfort compared to the distinct pain I had before in my other (also very good) sneakers. I still can't do much without a lot of bruising and swelling but my doctor has assured me I can't do more damage--it's just a matter of what I can handle and getting my foot back into shape. It feels so good to just be doing something again! I also had my massage therapist work on my toe a bit at my last appointment and it's amazing what a difference that made. I think she must have broken up a lot of scar tissue or something. So I'm trying to mimic some of what she did as best I can at home. Hopefully within a few more months I'll be back to full movement (and no pain!) again. I missed posting my August Stitch Fix. If I recall, that one was five-for-five but I don't remember now what all was it in it. Sorry! My September and October Stitch Fixes were both five-for-five--woo! I'm now sticking with stylist Kathryn. She's fantastic. It helps that she spells her name the same way one of my sisters' middle name is spelled; it's an unusual spelling so it it feels like a little bit of home. ...is in this collage: I didn't have time when I got it to model anything. It's all already gotten worn quite a bit. 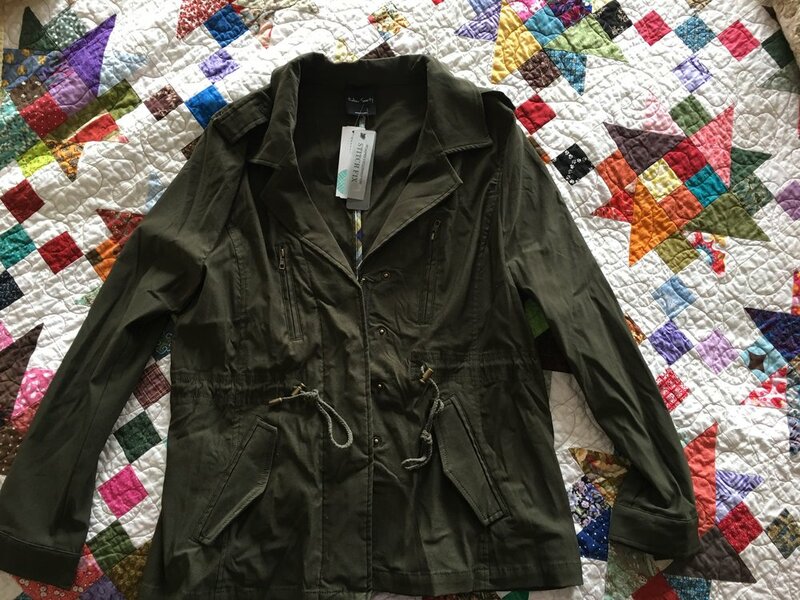 Stitch Fix's exchange process worked beautifully, by the way. Couldn't have been easier. I just clicked the right buttons in the check-out process, sent the two I was exchanging back in the envelope provided, and received the replacements within a few days. Easy Schmeasy. Another five-for-five! This time I'd mentioned that the holidays were coming up and I'd like something that would be appropriate for family holiday 'dos. I also asked for a smaller shoulder-bag of some sort, as most of my bags are now tote-sized. They do so well at purses and totes for me, I kinda want to keep them coming! Other than that, I left it pretty open. I think we're hosting my husband's family, or at least part of it, at our house for Thanksgiving. I usually wear nicer jeans or leggings, but I like to wear a more festive top. However, I'll also be in the kitchen so I don't want anything too fussy or hot. I think this blouse will be perfect--although I'd have to watch those bell sleeves in the gravy. I think they're high enough up my arm, though, they shouldn't be much trouble. It's an embossed velvet, and has a built in cotton cami. It's loose and cool, and I think it'll be great for the day. I haven't decided what necklace I'll wear with it, but I like the concept. Kathryn said in her style note that she decided to "push me" a little out of my comfort zone with this one and hoped that it worked. Work, it does! This is a two-fer: I'm modeling both a sweater and some skinny jeans. The sweater is fan-freaking-tastic. It's cotton and loose but not dumpy. Kathryn noted the slightly artsy take on the angled hem. (I'd said in my style notes that I tend to be more classic/casual but love stuff with an artsy/boho flair). In my request for this box, I'd mentioned that I like the look of blouses layered under sweaters but hate the constricted feel of the sleeves when I do that, so thought maybe a looser sweater might work. I think this one could layer easily, although I'll probably mostly wear it on its own. The pants are getting exchanged. They're black skinny jeans, with the emphasis on SKINNY. They've got some give to them so I can get them on, and even walk around fairly well. Sitting, however, is a bit of an issue. Although I could hang onto them as aspirational, I'd prefer to exchange them for the next size up and actually be able to wear them comfortably the next few months until I re-lose the few pounds I re-gained during the foot debacle. Even too tight, though, the pants were remarkably comfortable. I can't wait to get the pair I can actually wear. I think these may well become go-tos. Finally, this last picture includes a scarf and handbag. I had let Kathryn know that I'm a fan of scarves so she can pretty much never go wrong tossing one in the box. This one is fairly large, and I'm not always a huge fan of geometric prints, preferring abstract, organic, or floral. However, in this case, and for fall/winter, geometric works fine, as does bulky. 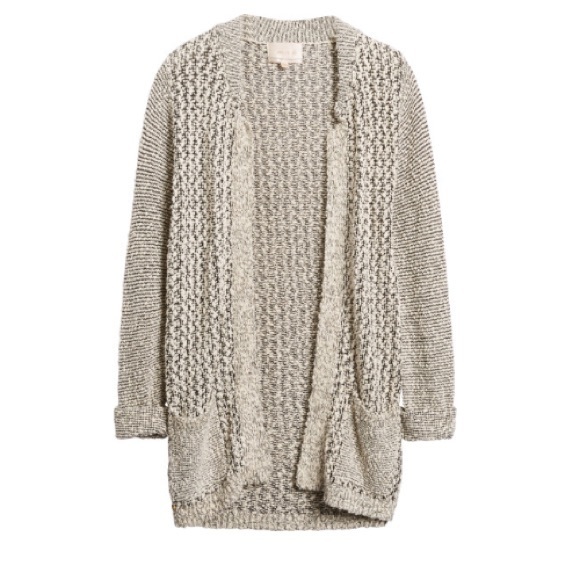 I'll be thrilled to have this once the temperature starts dropping. And this is one seriously soft scarf. Who knew I really wanted a yellow shoulder bag? I didn't, until I opened this up and fell in love. It's a great hobo-style bag, with all sorts of pockets. It'll be my daily bag now. In fact, I already switched out of my other bag and into this one and will be taking it with me when I head over to my MILs for dinner tonight. The mustard yellow is perfect for fall, and it'll go great with my olive jacket from the last Fix. I didn't realize I had a thing for purses and totes until very recently. And now, with Kathryn doing so well at getting me ones I love and can really use, it's hard for me not to want one in every box! I have clear memories from childhood of my mom "changing purses" every Sunday and thinking how silly that was. Now I'd say "I'm turning into my mother," except that train left the station years ago. The purse thing just confirms it. In my requests for my next Fix at the end of November, I told Kathryn that my husband's office party is in December. It's a dressy affair, but there's a wide interpretation of what that means for women, so I'm thinking I'll do some sort of pants outfit this year as I doubt I'd be able to be in heels yet. I gave Kathryn some parameters and let her know that if she wanted to try to do the whole party outfit, clothes to accessories to clutch purse, she could go for it! It'll be fun to see if she comes up with something. She's been dead-on-point every time these last few boxes, so I have high hopes! If you want to check out Stitch Fix for yourself, here's my referral code!